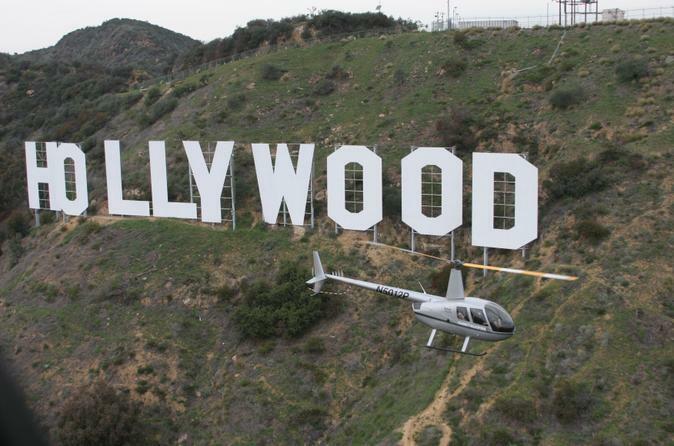 Before you begin your cruise or after it ends in port in Los Angeles, take to the skies for a Hollywood tour by helicopter! On this exhilarating 20-minute helicopter flight, you’ll fly over all the famous sights of the city and the Hollywood Strip. Travel in style from the port in a luxury PT Cruiser, complete with limousine accoutrements like a stocked minibar and snacks. Los Angeles is a sprawling metropolis, and the best way to see it before or after your cruise is by air! On this 20-minute helicopter tour, enjoy spectacular aerial views of the world-famous Hollywood Strip, as well as downtown Los Angeles skyscrapers and the Los Angeles Coliseum. See Grauman's Chinese Theatre, the Hollywood Walk of Fame, Hollywood and Highland, the Capital Records Building and all the new developments in Hollywood. Your tour includes a souvenir T-shirt and a professional photograph to remind you of your scenic flight over Hollywood.